ANTHOLOGIES of fiction and essays on the beach, crime, explorers, you name it have been very popular in recent Australian publishing. But, as far as I'm aware, this is the first time an Australian public gallery has used the anthology format to explore works in its collection. Presenting essays on some 150 Australian art works by more than 40 authors, 'Brought to Light' is therefore something of an experiment in art gallery literature and for the most part, it's one that succeeds. Several of the essays are concerned with expatriates, wanderers and outsiders, like Isaac Walter Jenner, an expatriate English sailor turned painter, who arrived in Brisbane in 1883 and found there wasn't much of an art scene. Jenner was so appalled at the Moreton Bay colony's lack of couth that he confided to a friend in England that such was "the thick mass of ignorance through which one has to wade in the matter of art in this country, the people here cannot see colour except as Rad, Bloo and Yaller." A few years later another Australian artist, sculptor Bertram Mackennal, back in Melbourne after stints in London and Paris (where he was in good company with expat painters like Bunny, Lambert and Fox), was equally despairing of the limited prospects for artists in Australia: "I wish," moaned the somewhat self-pitying Mackennal, "that I had been born English or American". Not all the artists, however, had to struggle like Jenner and Mackennal for commissions. Susan Herbert's 'HJ Sketches the Scene' follows an intrepid and affluent young Englishwoman in outback Queensland in the 1880s, Harriet Jane Neville-Rolfe, who takes her watercolours with her on kangaroo shoots on Alpha Station (500 km west of Rockhampton). At the opposite extreme of such hearty bucolic adventures, Mary Eagle's 'A Painter's Silent Protest' is constructed around a Melbourne painter, Peter Purves Smith, who visits London in 1938 and develops a bad case of high anxiety as Europe anxiously watches Hitler's jack-booted Nazis massing in Austria. Purves Smith was among the 20th century artists who rejected the high-minded salon painting that was taught so dully in London and Australian academies until well into the 1940s. The real education of the post-war modern painters who followed -- Albert Tucker, Joy Hester, John Perceval and Sidney Nolan -- was in the Bohemian cafes, pubs and the Melbourne house of art patrons John and Sunday Reed, where artists and writers passionately debated the artistic controversies and scandals of the day. After the war, personal expression and the construction of national identity and myth would rule Australian artists like Nolan, who in 1947 fled from the Reed's house, and the "huge emotional climate" of his hopeless triangular love affair with Sunday Reed, to Brisbane and Fraser Island. There, Nolan found yet another mythic outsider to add to his repertoire of outlaws and failed explorers: the castaway, Mrs Eliza Fraser, who was shipwrecked in 1836 off the Queensland coast, captured by Aborigines and rescued by a convict (whom she later turned in). With the faithless Sunday Reed in mind, Nolan painted excoriating canvases of a naked, abject Eliza, forced into grovelling, bestial submission. The cities, landscapes and mythic protagonists in these and other essays are vivid and compelling because the artists are so often vulnerable and perplexed as they strike out into new and unknown territory, both terrestrial and emotional. This is particularly evident in Albert Tucker's wartime pictures of Melbourne at night, where the artist is troubled not so much by the threat of alien attack as by images of a city unravelling as teenage whores and murderous soliders rule the streets. On the other hand, other artists responded to the tensions of modern times with cooler, cerebral images. The harmonious, lyrical abstractions of artists such as Godfrey Miller and Yvonne Audette -- as well as the deeply spiritual watercolours of Albert Namatjira and Dreaming barks of Arnhem Land -- provide some respite in the book from the rampaging emotions, hormones and egos of Nolan, Hester, Tucker and Co.
Meeting such a diverse bunch of artists is one of the pleasures of reading this book, which also gives you a sense of the wide range of opinions and approaches to art today. Yet in 'Brought to Light' one notices how rare the distinctive, individual art writer is. Some of the writers on Queensland artists especially have a problem with tone: their essays seem kind of scolding and cringing, taking the artists to task as if they were embarrassed by their provinciality. But what is the point in doing a book on the Queensland Art Gallery and being ashamed of the state's own art? In a sense, all art is regional, so you might as well get right into it! On the whole, it is the well-known, senior writers who do the best job: Humphrey McQueen with his dry wit, Virginia Spate with her delicate yet persistent teasing out of meaning. Of the younger or newer writers, Drusilla Modjeska stands out with a quite enthralling reading of a portrait one might at first glance overlook. But I doubt whether I could distinguish, say Pamela Gerrish Nunn from Mary Laurenson, or David Burnett from Rodney James. A couple of essays could have been left out: Pat Hoffie's feminist take on A.M.E. Bale and Elizabeth Bates on Ray Crooke ("nature will burst forth with new-found enthuisiasm to announce another day") do not get beyond the predictable. But more to the point, there is much left out than one would want in -- such as a stronger selection of prints, drawings, ceramics and sculpture (which do, indeed, exist in the QAG's collection, including quite fine works by Harold Parker, whose exclusion seems regrettable). 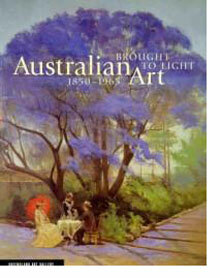 And though there is an introductory essay on the gallery, this is not enough: the book is about Australian art seen through the lens of one collection -- it requires as well another essay or essays on Australian art during the period covered, to take an overview and pull together some specific themes. A volume like this need not present a definitive account of the era it covers; but it should contextualise its offerings. As it stands, ordinary readers who plough through this hefty 320 page text are likely to emerge at the other end, scratching their heads and wondering what conclusions might be drawn. These drawbacks, however, should not blind us to the QAG's considerable achievement in describing and illuminating some very interesting art works. As usual with QAG books, this is a handsome volume, well designed and illustrated in colour throughout. Copyright © 1998 Sue Smith. Not to be used without permission of the author.